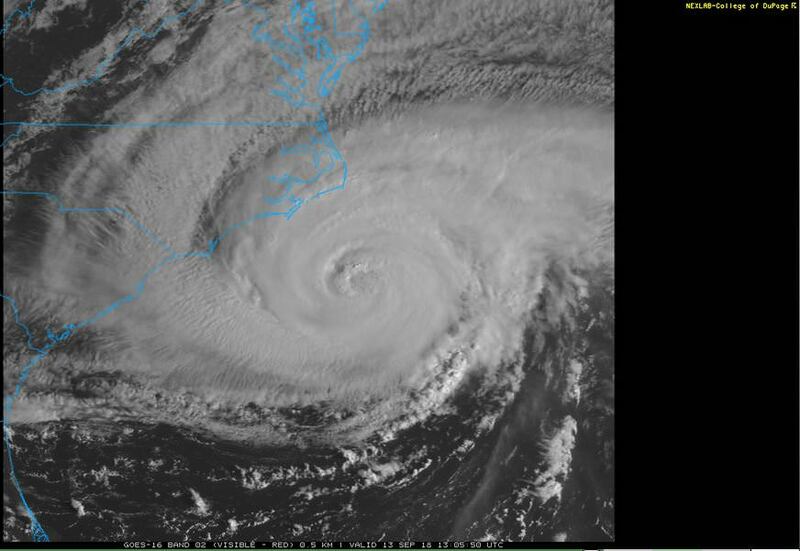 While Hurricane Florence has weakened, it is still a dangerous storm. In addition to Florence, we have Hurricane Helene (Cat 1), Tropical Storm Isaac, Tropical Storm Joyce, and another tropical waves that stand to develop into tropical cyclones in the next 48 hours. Hurricane Florence is currently a Category 2 storm, with sustained winds of 95 kts (110 mph), and a central low pressure of 956 mb. It is located at 33.1 N and 75.1 W and moving west northwest at 11 kts (12 mph). The storm ran into a pocket of strong shear, which has weakened it significantly. In the visible satellite image, you can see the well developed eye, though it is not nearly as defined as yesterday. 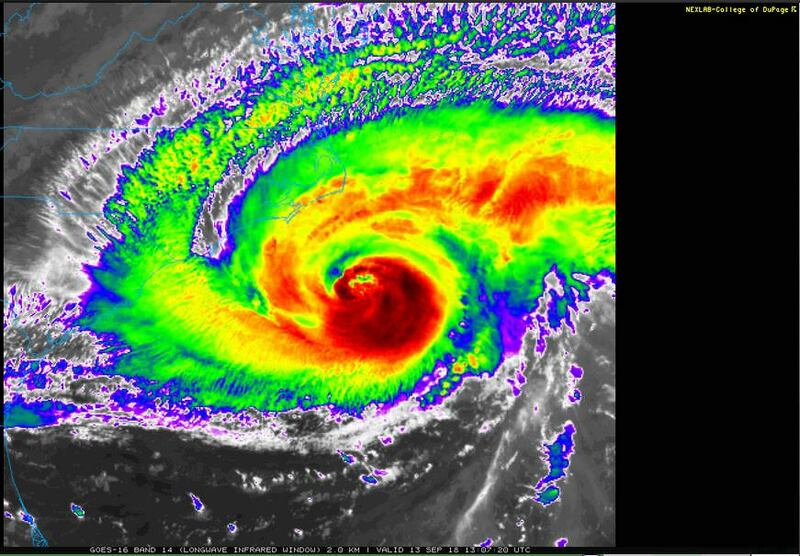 On the infrared image, you can see that the eye wall is still very strong, with high, cold cloud tops. The eye is having a little trouble staying clear, and the stronger eye wall is now in the southeast quadrant instead of in the northwest. I will be thinking and praying for all of the folks in the paths of these storms. This is a giant mess. Even though the storm has weakened, it is still a significant threat. It might even be worse- many people will think that the weaker storm means it is safe to skip some of the hurricane precautions. If you are in these areas, do NOT think that Category 2 Hurricanes are weak. 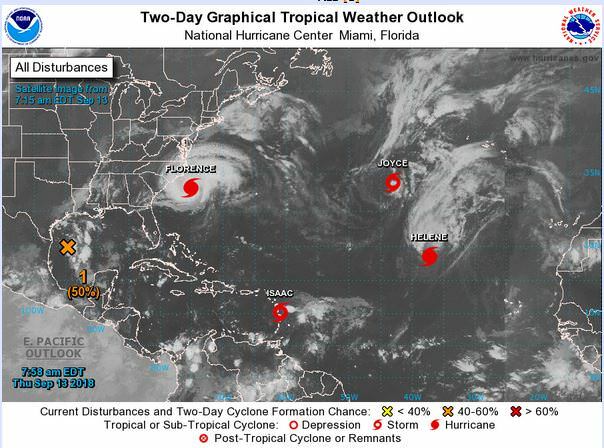 This entry was posted in Hurricane Tracking, Practicing Concepts, Predictions, Satellite Imagery and tagged #gawx, #mdwx, #ncwx, #scwx, #vawx, category 1 hurricane, category 2 hurricane, Delaware, DEWX, Georgia, hurricane, Hurricane Florence, Hurricane Helene, hurricane joyce, Maryland, meteorology, north carolina, South Carolina, tropical storm, tropical storm isaac, tropics, Virginia, weather. Bookmark the permalink.